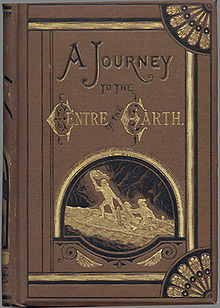 a classic science fiction novel by Jules Verne (published in the original French as Voyage au centre de la Terre in 1864). The story involves a professor who leads his nephew and hired guide down a volcano in Iceland to the "center of the Earth". They encounter many adventures, including prehistoric animals and natural hazards, eventually coming to the surface again in southern Italy. This 1877 translation by Frederick Amadeus Malleson is considered the most faithful, though it has some slight rewrites. Book cover for an earlier 1874 edition. Chapter IX: Iceland! but what next? Chapter XXIV: Well said, old mole! canst thou work i' the ground so fast? Chapter XLIII: Shot out of a volcano at last!